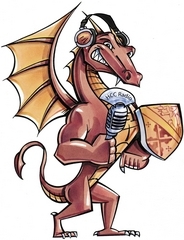 HCC Radio The Dragon is a growing student and community- based internet radio station streaming from Howard Community College in Columbia, MD. HCC Radio The Dragon is run out of our Television and Radio Academic department. Our academic department has expanded recently to provide hands-on training to students interested becoming radio professionals, with an additional specialized focus on public radio. In that vein, we are expanding our radio station from all-music format to include public radio-style, spoken-word programming. In our academic department and at HCC Radio The Dragon, we believe in the power and educational value our students obtain in listening to great work by professional producers. Our students listen to pieces on PRX, analyze what they learn from the work, and discuss why they want to select the work for streaming on our internet station and/ or for podcasting on our website. We highlight different format of pieces, from documentaries to personal essays, sound art to insightful interviews. We also train students to produce great radio for streaming on our station, with approval by our program director. The professional television wing of our department, HCC TV, has been a recipient of many awards including the Emmy Award, Telly Awards and Davey Awards. HCC Radio is our newest endeavor; our programming and audience are growing and we greatly value the opportunities our students get from learning from and selecting your work.